The Skirvin Hilton Hotel is an establishment ingrained in the history of Oklahoma City. Since 1911 the hotel has been at the center of several vibrant arts and culture movements that have transformed the city to the unique cultural destination that it is today. Now, more than a century later, Skirvin Hilton has commenced a unique Artist In Residence program that hosts world-class artists in a one-of-a-kind studio space. This program reinforces the importance of arts in our community and gives all Skirvin Hilton visitors a chance to interact with Oklahoma artists and witness the evolution of the artwork first-hand. Jerry Bennett is an accomplished comic and pop culture artist. 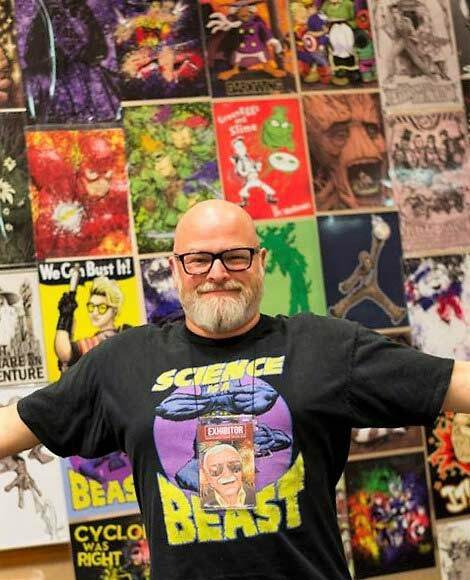 Bennett prides himself on not only being a talented comic-focused artist, but also working as an educator by creating workshops and demonstrations for organizations such as Positive Tomorrows, Metropolitan Library System: MWC Moore and Northwest Branches, and University of Central Oklahoma, in addition to speaking at local events such as the New World Comic Con and Soonercon. Aside from engaging in public speaking, Bennett is also a freelance artist who has worked with industry titans such as DreamWorks, Stan Lee, Scholastic Children’s Books and Upper Deck (Marvel), to name a few. Starting October 1st, as the 2018-19 Skirvin Hilton Artist in Residence, Bennett will create a series of original short comic book vignettes consisting of original pen and ink pieces, in addition to the creation of a unique Oklahoma-centric comic book. Inspiration for the project will stem from Oklahoma City’s landmarks, as well as popular sites throughout the state. Additionally, as part of his residency, Bennett encourages and welcomes guests of all ages to stop by the studio to craft and design their own mini-comic, which will serve as a memento of this year’s Artist-in-Residence program.